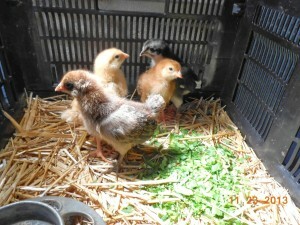 I have to brag about the new additions to the Urban Acres Farmstead family. About 10 days ago I was placed in charge of 4 little fuzzyballs of peeping chicks. The peeping subsided once they were installed in a straw-bedded crate with water and food and a heat lamp. Full tummies helped them settle down and take a much-needed nap. By the third day, however, they were in need of a deeper crate, and one with a wire top – one was trying to fly to the lip of the crate to make a getaway. Now, in their second week, they’re ready for another move – to a borrowed indoor coop that will give them some vertical room to test their wings, learn to roost and grow more. The routine is to change their water, add fresh chick mash, more wheat straw and a half cup of chopped greens. They seem to prefer parsley, do not care much for brassica greens, and love lettuce as well as bok choy. Our chicks are representatives of four different breeds – Wyandotte, Rhode Island Red, Araucana and New Hampshire. I’ll explain a bit about each one. The Wyandotte coloring is a speckled black and white. It’s a traditional homestead bird, bred for both meat and egg production. The silver-laced variety was first standardized in 1883 in the US. Wyandottes can look heavy due to their feathering. Eggs are light tan to brown, and they are medium to high egg producers. A Wyandotte hen can weigh up to 7 pounds. The Rhode Island Red is a very well-known bird and it was developed for both meat and egg production. It’s adult color is deep red, and egg color is a light brown. As a high egg producer, a Rhode Island hen can lay up to 250 eggs a year. Historically this has been a reliable bird for beginners because it can adapt to extremes of climate. An adult Rhode Island Red hen can be about 6 pounds. The Araucana can grow to 5-6 pounds, and originated in South America (Chile), but the breed was imported to the US in the 1930s. It is a “crested variety” and has ear tufts on either side of its head. Araucanas are hardy and can handle poor weather conditions easily. They are known as the “Easter Egg” chickens, because their eggs can be tinted blue or green. Our little Araucana may reach 5-6 pounds when she’s an adult. Our New Hampshire Red is also a US breed, developed during the early 20thcentury, but became popular in Europe in the mid-twentieth century. It was primarily developed for egg production. The eggs are light brown to brown. This chick may top out at about 6 pounds or so. Dr. Joseph Barber (ed. ), The Chicken: A Natural History. Lewes, East Sussex, UK: Ivy Press, 2012. Christine Heinrichs, How to Raise Chickens: Everything You Need to Know. Minneapolis, MN: Voyageur Press, 2013. Suzie Baldwin, Chickens: The Essential Guide to Choosing and Keeping Happy, Healthy Hens. London, UK: Kyle Books, 2012. Jenna Woginrich, Chick Days: Raising Chickens from Hatchlings to Laying Hens. North Adams, MA: Storey Publishing, 2010. Posted in backyard chickens, chickenkeeping, chickens, chicks.